Home/What is the solution for?/How does the solution work? The Clairitec all-in-one HMI solution (+ I/O control) contains all necessary hardware & software for you to easily equip your devices with display modules or display & I/O controller panels and to create a custom graphic & touchscreen HMI for them. With provided command sets you conduct the HMI programming and I/O programming in order to “bring to live” your graphic user interface and your application functions. All Clairitec HMI panels, modules, and boards are equipped with an integrated graphics processor and dedicated storage memory for your graphic user interface. This allows you to use all Clairitec HMI products even with simple mainboards. No high processing power or large memory space is needed on the mainboard of your device; all you need is serial connection to send control commands and receive feedback. The display (+ touchscreen) is directly connected to – and controlled by – the Clairitec boards as well. The software program GraphConverter with its “WYSIWYG” HMI editor allows you to create – very quickly & easily – a custom graphic & touchscreen user interface and to upload it into the Clairitec panels, modules, or boards. You steer the HMI panels, modules, or boards – this means your graphic user interface and the integrated inputs/outputs – with a set of provided control commands. These commands are integrated into the main code of your application on your mainboard and are sent to the Clairitec products via serial connection. The Intelligent Displays, HMI Boards, as well as the Programmable Intelligent Displays in add-on version (without an integrated programmable board) are designed as add-on modules: they complement your own mainboard & application. The serial communication channel is later used for the transmission of the control commands to steer your graphic & touchscreen user interface as well as the integrated inputs/outputs in the case of the Programmable Intelligent Displays. The Programmable Intelligent Displays in standalone version have an integrated programmable board with microprocessor. This allows you to program your main application, including all control commands, directly into the panel. Based on your project, GraphConverter will create a reference file. This reference file contains a description of your HMI project, listing all HMI pages you have created and all objects placed upon them (graphic objects, text zones, touch zones, etc.). For each object, the specific coordinates on the screen and its characteristics are described. When conducting the HMI programming, you will use this information to fill out the parameters of the provided control commands. 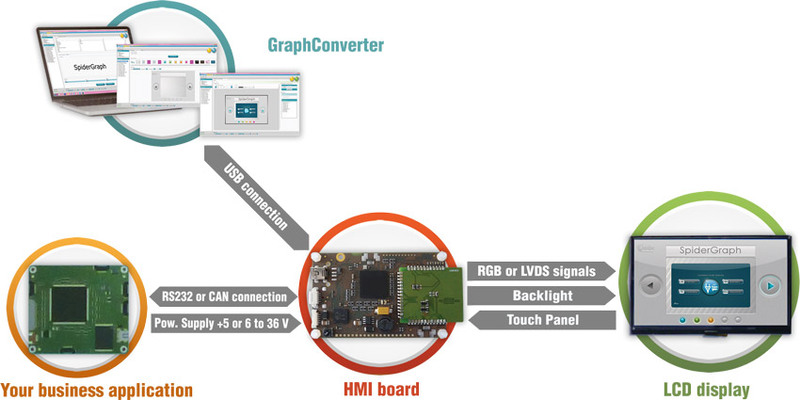 You will find more information on this software program here: HMI Editor Software GraphConverter. You conduct the HMI programming with a provided set of control commands, integrated into the main code of your application. For the Programmable Intelligent Displays, a second set of control commands is available. All provided control commands for the HMI programming, as well as for the I/O programming, are already pre-programmed in C language. This allows you to directly integrate them into your application code, if you work in this programming language. Otherwise, we also provide the “raw code” of the commands in form of byte sequences. This enables you to adapt the commands to any high-level programming language of your choice!